Enter the not-so-distant future where boxing has gone high-tech - 2000-pound, 8-foot-tall steel robots have taken over the ring. 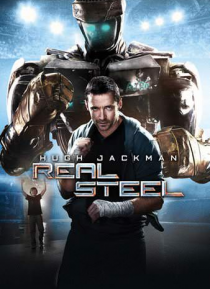 Starring Hugh Jackman as Charlie Kenton, a washed-up fighter turned small-time promoter, Real Steel is a riveting, white-knuckle action ride that will leave you cheering. When Charlie hits rock bottom, he reluctantly teams up with his estranged son (Dakota Goyo) to build… and train a championship contender. As the stakes in the thrill-packed arena are raised, Charlie and Max, against all odds, get one last shot at a comeback. Visually stunning and complete with knockout bonus material, Real Steel is a pulse-pounding, inspirational adventure filled with heart and soul.